Life is really busy. No, that’s not right, let me try again. Work is consuming me. I’m pressured, stressed, exhausted and for the first time in my life that I can remember have so much workload that I’m failing to achieve what I’m setting out to do. If I was a normal 43 year old working away to my current State Pension Age of 67 then I really would have to be doing something about it as it is just not sustainable long term. Looking at my progress to Financial Independence tracker is however going to make me do something else instead. Today, I have wealth of £938,000. This is also my net worth as I have £0 in debt. With a FIRE (financially independent and retired early) target of £1,000,000 and provided Mr/Mrs Market behaves him/herself I should be able to close that gap in 6 months according to my Excel spreadsheet. That is not far away and now requires me to do some things over the coming months. the weather. Not much point moving in the middle of winter. tax efficiency. As I’ll have the opportunity to work for only part of the year it seems to make sense to earn enough in a tax year to take me up to the start of the 40% higher rate income tax rate to maximise my FIRE wealth for a given work effort. work projects. I do have some longer term projects at work that I would like to finish. I know I don’t have to but for me at least I feel it is the right thing to do both for myself and those who work around me. assured shorthold tenancy (AST). As a renter I have a tenancy period that I need to comply with. There is no point paying rent on a flat that is empty. Eyeballing that and it looks a little wrong. A little too much property, gold and emerging markets. Not quite enough bonds and likely not enough cash to live off the dividends securely during a severe bear market. Now if I reverse engineer it and simplify it I see it as a 75% ‘Equities’ (Equities, Gold and half of the Property) and 25% ‘Bonds’ (Bonds, Cash and half of the Property) portfolio. If I use that assumption, my plan to drawdown in FIRE at no more than 2.5% after investment expenses and the following chart from the 1st Edition of the excellent Smarter Investing: Simpler Decisions for Better Results which assumes a 30 year drawdown horizon (hopefully I’ll be a lot longer than that) and 0.5% investment expenses (mine are a lot less than that) at first glance it looks like I could do with a little less ‘Equities’ if I want to maximise my chances of having my wealth outlive me. This is aligned with my first thoughts above but of course requires some more work. It’s no secret that my better half and I have been planning a move to The Med for some time now. 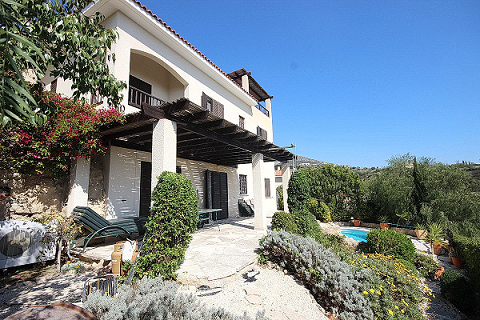 We’ve considered countries such as the Italian coast (now out of the running), Malta/Gozo, the Spanish coast and Cyprus. We have one more trip planned for late summer from which we’ll make our final decision which fits with the timescales of leaving work while giving enough time to finalise plans. Final note: With very limited non-work time of late I have been faced with the choice of blogging or family time. This has meant I haven’t written in a while. It was therefore most humbling (and demonstrates the type of community we have here) to log in this morning and find plenty of IM’s, emails and comments from regular readers checking if I was ok and wishing me well. Thank-you to all of you. With £630,000 and a home (paid for) I'm going to be still working after 50 but probably not as far as 60. Are you making any provision for additional expenses re your children? In a few years they might want a university education, house etc. 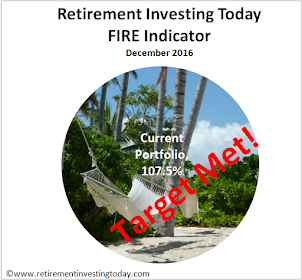 Could they look at you retired early as a cash cow? If you don't help them out, could it lead to resentment? Particularly bearing in mind most of your wealth has come from earnings, via a UK education then job. You are taking them to the Med, will their opportunities be the same as yours? Maybe start a fund for each of them now, from any extra earnings above FIRE? Given the modern UK we live in. One where anyone young who wants to get ahead is looking at huge debts before they even enter the workforce. I believe your idea is sensible for any parent who can genuinely afford it and not just someone who is FIRE'd. I'll actually go one step further. This should be taken care of before consumption takes place in my world. In your shoes I'd leave work in about November and spend the winter seeing how much I liked the Med winter in different spots. Thanks especially to a couple of anonymous commenters on the (British) Motley Fool, and to the American blogger Wade Pfau, I have at last decided to view our wealth as follows. On this picture we'll hold virtually no conventional equity, and ditto conventional bonds. So be it. The dividend on our Equity will exactly pay our rent; the coupons on our Bonds come with inflation-linking, low risk (we hope), and in amount enough to cover our routine annual expenses and provide a surplus most years. Moreover the bulk of our wealth should be easy for my widow to run. I still need to think more on how to protect her from fraud and theft, especially as "cognitive decline" sets in. This view might suit people with substantial DB pension income, so won't be much use to you. I've posted it here because it might be useful to some others, and it has taken me ages to adopt the simple clarity that it provides. Naturally I'd welcome all critical comments, constructive or otherwise. - If you're talking about the home you live in then for me I will not even consider it as part of my wealth. It is somewhere to live and it matters not if it doubles or halves in value once I own it. - If you're talking about an investment property (or in my case industrial/commercial REIT's) then I follow Hale's guidance as I detailed in the post. 50% goes to 'equities' and 50% to 'bonds'. It's our own house. It will pay for my widow's old age care, and if needs be equity release on it will pay for mine first (if I need it). It's wealth, its value can vary up and down, and it pays dividends (imputed rent). So it's equity. Good to see a post, RIT. Work sounds terrifying all consuming there, must be tempting to pull the trigger earlier and, like Dearieme says, take the winter off. Perhaps once you pass that mark in around 6 months time your relationship with work will change anyway as it shifts towards 'voluntary'. It's still fascinating how the graph of your wealth is basically a straight ling. - at current rate I will be done in 9 years. Compound interest just doesn't get a chance to kick in over such a short period. 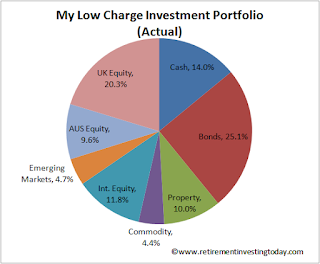 - my portfolio is not chasing aggressive returns. It just never needed to for me to be successful. Again this kicks compound interest into the long grass. - my rapid salary progression has meant that my annual savings when measured in £'s has ramped quickly as I didn't change my standard of living in response. 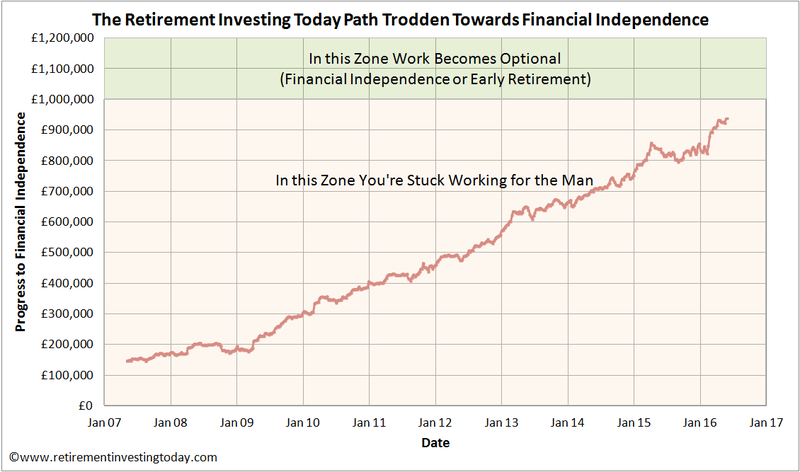 This then negates what compound interest effect there is in play. What % of your NW was contribution vs growth? I imagine it's a good 80%, accounting for the straight line nature, and a "growth of 10000" chart wouldn't be so straight line. 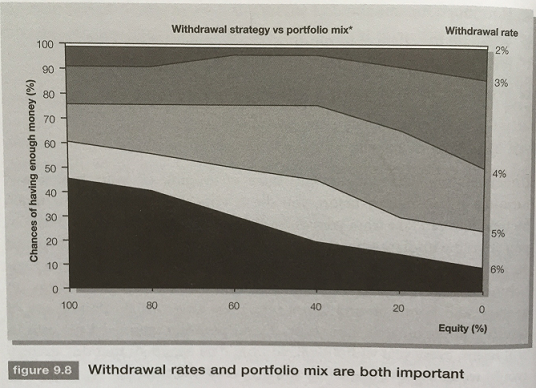 This underlines the lack of aggression required in a portfolio when there is confidence in future contributions. And going forward, the lack of aggression needed if sure of drawdown expenditure needs. 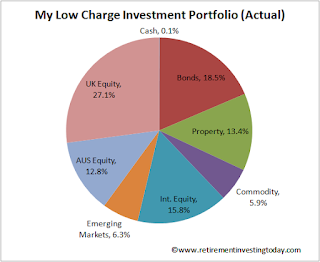 As I write this reply 32% has been investment return and 68% has come from saving (very?) hard. 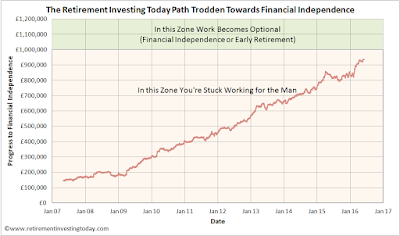 A 2.5% drawdown hopefully means I don't have to be (and won't be) overly aggressive in retirement either. I'd always thought of it in terms of the short time frame. But I suppose increasing income, little lifestyle inflation and so increasing savings means that any growth from previously accumulated savings is being bested by savings. Good luck over the final furlong! I really hope I have the courage to pull the trigger. Only time will of course tell but it's one of the reasons I continue to read and research. I'm still yet to find a reason why I don't have a high chance of success and so with every article I read and blog post I make my confidence grows. Hopefully this will translate into courage when I hit the £1M. bravo RIT - you are in the final furlong, a thoroughbread who has navigated every hurdle in the grand national of FIRE and not only have you proceeded at breakneck speed, you have also never shown even a hint of falling. You should give some serious thought to taking your foot off the gas now at work. If you think about it, you have a one-off chance to conduct a psychological experiment as to whether you slogging your guts out or not actually makes much difference to how your bosses rate your ability. Many argue that it makes no difference how hard they work to how there annual appraisals go. Some even go as far to claim negative correlation. You sound tired, so ease up and start observing what happens. You'll never have the chance to do this again so make the most of it. It cannot harm your future plans as they are completely independent of your employment - so look on it as a no-lose situation in which you could gain some wisdom and insight into performance in the corporate world. In all honesty I have on a number of occasions considered doing exactly this. Unfortunately I've never been able as I really am built to execute whatever I take on at 120%. Whether that be work, FIRE, study etc. It will be interesting to see what rises to the top of my 'must do well' mindset during the next phase of my life. Is there a minimum NI you need to pay in a tax year to accrue that years' right to the Basic State Pension. I.e. another notch up to the 35 years required for a full State Pension? Will you be taking that into account? During FIRE I intend to pay voluntary Class 3 NI contributions for both my better half and I until we both reach 35 years of contributions. This is my insurance policy and a post on the topic can be found here. "a thoroughbread": yeah, he's on a roll. May I just start dreaming? 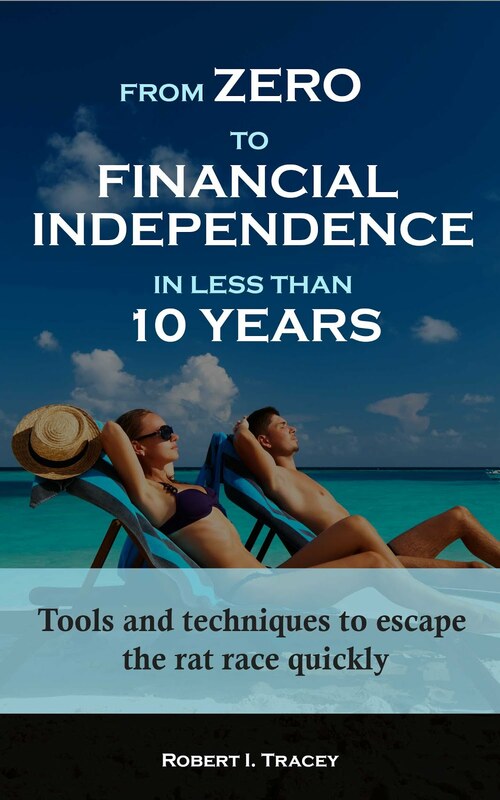 I am 40 and willing at list to retire free of debt. Love your post! Early on I quickly learnt that reinvesting dividend's during the accumulation phase was crucial however I really didn't think about living off them until late 2011 when I started the HYP. This year with a fair wind I should see £23k or so of them. I've commented on it in the past, so won't repeat it here, but BTL is one investment that is not for me. Do you have a few thoughts about what you want to do in retirement? (No need to disclose them here.) Maybe we all need something to give us a sense of purpose, even if it's not paid work. I expect that I am not the only one that would love to see you write a book, at your own pace, about your journey. I'd love to get the message out there but my concern is my methods are a bit niche so readership vs effort might not balance. We'll see. If you write a book during retirement are you really retired though? As the Australian equities are there by default, i.e. at one time you were thinking of moving there, shouldn't they be sold ahead of other things to raise cash to buy the house? 12.8% isn't an insignificant amount to have in something that shouldn't really be there. Unfortunately they are also not distributing funds so to sell them now would see the full gains taxed as income which would be crippling right now. I pay enough tax without giving yet more to HMRC. Once I'm non-resident and sure I'll never be returning to the UK I will however start to sell them down if our chosen country doesn't inflict capital gains on me because the fund expenses are also ridiculously high with the worst being 1.23%. For now I just let the dividends continue to spin-off which I then invest elsewhere meaning their contribution lessons continuously. To demonstrate in late 2011 they were 21.3% of the portfolio. In subsequent years that has reduced to 20.2%, 18.4%, 14.2%, 9.9% and they are currently 9.6% of portfolio value. OK I hope it works out OK. Looking back, RIT, do you think people who hope to retire early and retire abroad might consider investing using offshore insurance bonds as an anti-tax wrapper? I get the impression that the tax deal is good but the costs are horrendous. I haven't looked at them in a long long time. When I did many years ago I seem to remember the fees were eye watering compared to the fraction of 1% I'm prepared to donate to the financial services sector. Feel like I'm a spectator on the Champs Elysees cheering on Bradley Wiggins as he comes home to win the Tour. Hi TA. You've been on a FIRE journey for some time now also. How close do you think you are? To answer your first question - still working on the allocation but from what I can see so far it's not going to be much of an event from what I have today. I'll put up a post once I have done some more work. Second question. I'm actually thinking to just hold a constant allocation with rebalancing bands for when Mr Market gets a bit excited. Good to see that you are ok, RIT and how exciting that your goal is a mere 6 months away. Along with all your supporters, am rooting for you til the end and can't wait til you cross the finish line. Thanks for the wishes weenie. With your high savings rate I'm sure you won't be far behind my journey. You are so close RIT! Congrats. And good luck for the finishing touches. You have asked for views so here is mine: stop bothering with the admin/paperwork/compliance. See if it really matters and if it magically gets completed anyway. I enjoy my work, but I dislike the faff (which I am rubbish at anyway!) that goes along with it. I'm 6 years away. Can't get excited about it yet but it puts a smile on my face to see you in the home straight. I'm thinking 50:50 allocation at FI then need to make my mind up about stable or rising glide path. Congrats on nearly reaching the magical £1 million mark! Its been great to follow your journey over the years and to see you finally achieve your goal in the next few months. I myself have opted for the dividend route so there will be very little reason to tweak my portfolio once I reach financial freedom. If you are only making one more trip abroad before the big decision, do you know the destination of that trip? Presumably that trip will be to your most likely new country? Will you buy a house to move into or rent initially?